According to Ford Motor Company, the mighty SVT Raptor F150 has seen record sales months in 8 of the past 10 months and that has allowed 2013 sales of the Raptor to grow by 14% over the previous year. Although it is one of the more expensive trimlines for the Ford F150, it is still one of the fastest-turning vehicles in the American auto industry with just a 15 day supply on hand at dealerships around the country. For reference, the average (and the target) for most vehicles and automakers is a 60-day supply so with the Raptor pacing just a quarter of the average – it is clear that these high performance offroad pickups are flying off of dealership lots. Although the Ford SVT Raptor F150 was an amazing piece of machinery when it was introduced for the 2010 model year, the Special Vehicle Team has continuously improved the Raptor package over the past few years. When first introduced, the Raptor F150 was only available as a two door SuperCab model powered by the 5.4L V8 with 320hp and 390lb-ft of torque. Helping to make this street legal truck just as comfortable when racing through the woods, Ford added a set of serious all terrain tires, industry exclusive Fox Racing triple bypass shocks, underbody skidplates and a special Hill Descent Control system in addition to a unique body package that provides for plenty of wheel travel while also giving the Raptor a distinct, aggressive look. Over the next few years, Ford introduced the Raptor SuperCrew with a larger cab and four doors along with a 6.2L V8 packing 411 horsepower and 434lb-ft of torque that replaced the old 5.4L V8. A 6-speed automatic transmission with Ford’s SelectShift feature helps funnel all of that power to the front and rear heavy duty differentials – both of which are fitted with 4.10 gears. After the Ford SVT Raptor F150 got more doors, more interior space and a bunch more power, the SVT crew took to making the Raptor even better in every possible offroading situation. The 2012 Raptor featured a Torsen limited slip differential along with a grille mounted camera to show the driver exactly what is in front of the truck – a feature which proves incredibly handy when dealing with rough, rocky terrain. For 2013, the Raptor received a set of beadlock wheels (another industry exclusive), high intensity discharge (HID) projection headlights and Ford’s SYNC infotainment system paired with MyFord Touch. 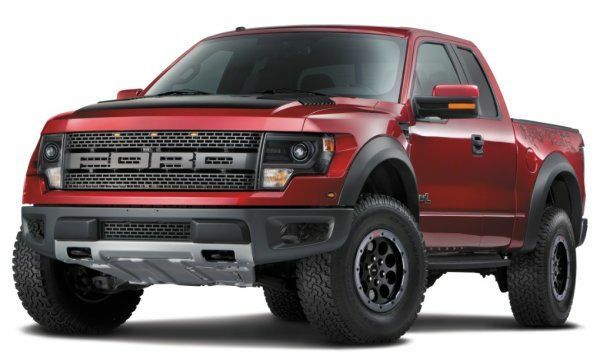 The 2014 SVT Raptor hasn’t received any new functional components but Ford and SVT have added a new Special Edition package that includes unique Raptor bedside logos, a unique Ruby Red exterior paint and a loaded up interior with two tone sport seats surrounded by all of the tech goodies that an F150 buyer could want. The result of all of these changes and additions to the Ford SVT Raptor F150 package is a steady increase in sales and with record sales throughout most of 2013, Ford Motor Company has been forced to increase production of the Raptor. In fact, production has been increased by 150% since the introduction back in 2009 and if things continue with this rapid growth – Ford may have to increase production of the mighty Raptor even further.